We have set up an excellent Quality Management System that allows us to maintain the quality of the machines that we offer to our clients. 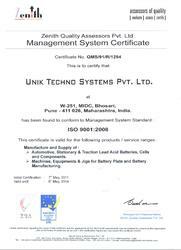 Our Quality Management System is certified by Zenith Quality Assessors Private Limited (QMS/91/R/1294). We ensure that the entire range, manufactured at our unit is up to the mark and meet various national & international standards. We have set up modern quality testing facility that allows us to test our battery manufacturing machines on their reliability and durability. To facilitate our clients, we also offer prompt technical support that ensures trouble free functioning of the machines. Before that, we invite representative from our clients and present detailed demonstration to make them comfortable with the handling of the machines. Our company has been founded by Mr. K. V. Natarajan, who has rich industrial experience of almost 50 years in battery industry. He has spent 30 valuable years with one of the most renowned battery manufacturers of India and has been engaged in various projects that included planning, implementation, maintenance of indigenously developed & retrofit machines, import substitutes and system implementation. He has visited many battery factories and picked up several innovative ideas to improve the range of our battery manufacturing plant and later battery manufacturing machines. Our company is run according to his principles that has really helped us to establish our company as a front-runner of the industry. Since the inception of our company, we have focused on continuous improvement of our Battery Manufacturing Machines that includes traction heat sealing machine, plate filling machine, tube plate filling machine, automotive batteries, tubular stationary batteries, power supply systems, emergency power supply systems,, etc, that offer superior quality. Simultaneously, we wish to increase the productivity of our manufacturing unit so that we can satisfy the ever-increasing demands of our clients. We are located in M.I.D.C. area of Bhosari that is approx 20 kms from Pune railway station. Our manufacturing unit is situated behind Century Enka near the Indrayani Nagar Chowk. Pune is about 150 kilometers from the industrial capital of the country – Mumbai and well connected with other metro cities of India by road, rail and air. We are easily approachable and our clients can at any time get in touch with us with their queries. Leveraging on our rich industrial experience of in Battery Industry, we have developed a niche in the field. Further, the expert professionals, associated with our company have also proven themselves the Asset our organization. Due to their approach and attitude, we have also been reckoned as a company that provides excellent technical support. We do understand that even after a detailed demonstration, clients may face few difficulties to operate the machines; hence, we are always ready to assist our clients with their queries. We provide complete solution to these queried that are not only related to machines but the pertaining process also. Expanders and other chemicals for paste mixing.